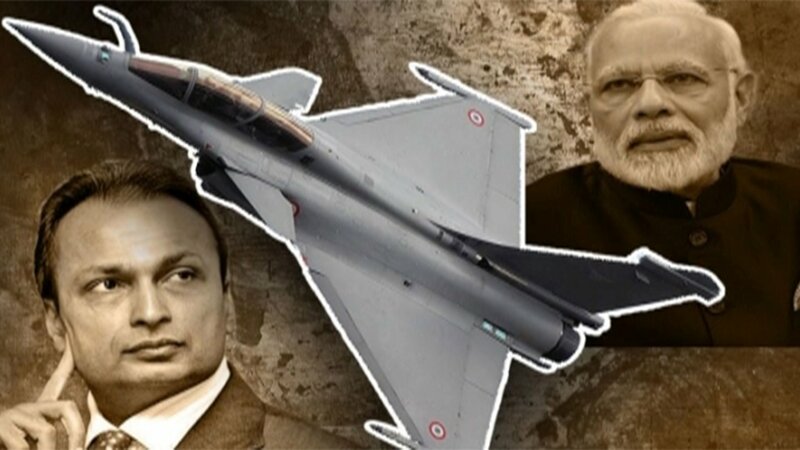 Rafale Deal: Is the Inter-Governmental Agreement a Smokescreen? Leaked government documents suggest that a group of politicians with no domain expertise compromised the country’s financial and legal interests, overlooking concerns flagged by the Defence Ministry. File Photo : Kya Mera PM Chor Hai? 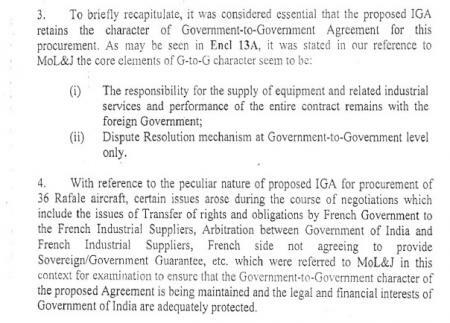 As skeletons continue tumble out on the controversial Rafale deal, leaked government documents show that the so-called Inter-Governmental Agreement (IGA) that the Narednra Modi government signed with France to purchase 36 aircraft in fly away condition, seems to be a smokescreen. The documents reveal that the Narendra Modi government severely undermined Indian interests and the agreement is heavily loaded in favour of France. On many contentious issues, such as sovereign guarantee/bank guarantee from French companies Dassault and MBDA, the waiver of the anti-corruption clause was approved by none other than the committee headed by Prime Minister Modi. At a time when the Modi government is trying to deflect public attention from the Rafale deal, more and more government documents appearing in the public domain suggest that a group of politicians with no expertise in the sector, by virtue of being Cabinet ministers and thus the members of Cabinet Committee on Security (CCS) headed by none other than Modi, compromised Indian interests to support a businessman friend of the Prime Minister. Take, for instance, a Ministry of Defence document from the Air Force Headquarters that clearly points out the problems with certain terms and conditions in the IGA which they thought were unusual, because of which it doesn’t look like a Government to Government Agreement (GtoG). 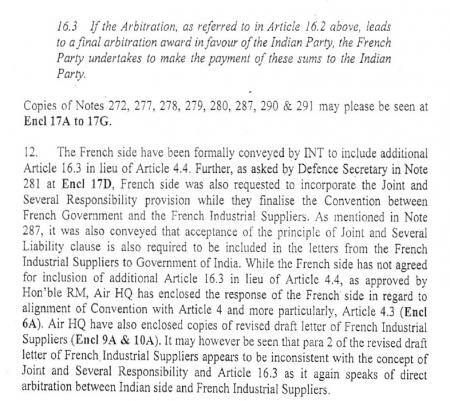 Here the three main points are, the issues of transfer of rights and obligations by the French Government to the French industrial suppliers, arbitration between Government of India and French industrial suppliers and the French side not agreeing to provide sovereign/Government guarantee. The Air HQ was clearly of the opinion that these may affect the G to G character of the agreement as well as the financial and legal interest of India. The Air HQ note also refers to two earlier notes (228 & 229) from Ministry of Law & Justice (MoL&J). Note 228 was signed by T K Malik, Deputy Legal Advisor, MoL&J (dated 19/12/2015) and note 229 was signed by T N Tiwari, Additional Secretary, MoL&J (dated 11/12/15) which suggested certain changes. It also suggested “However, as stated in para 3 of Note 231 (copy at Encl 15A), MoL&J have not specifically responded on the issue of getting G-to-G character affected by the provisions proposed by the French side”. And as per the Air HQ, issues affecting the G to G character of the IGA remained the same. In most cases, Malik aired the government view and suggested that the departments/ministries concerned should take approvals at appropriate levels. But in the case of sovereign guarantee, he too wanted the government to be cautious. In the note, Malik wrote: “French side has not agreed to give any bank guarantees. Instead French side had informed that a ‘comfort letter’ from French Prime Minister to provide assurance in lieu of sovereign guarantee. The contract involves huge pay outs without actual delivery which virtually means advance payment for which adequate Government/Sovereign guarantees appear to be necessary.” Later, he suggested that the ministry concerned should take a “conscious decision” in terms of the provisions of the Standard Contract Document (of Defence Procurement Policy 2013) and the Ministry of Finance. But, Tiwari had a different view on all the points mentioned by Malik, agreeing with him only on the sovereign/bank guarantee clause. Tiwari clarifies that as per the agreement submitted for vetting, if the French companies falter on delivery, the Indian government has to take legal remedies against those companies, as the French government is not involved. What happened after this is even more revealing. On August 18, 2016, the Air Acquisition Wing again proposed that a bank guarantee from Dassault Aviation must be insisted upon because even if the Modi government was terming it a G to G purchase, the advance payments would be remitted directly to Dassault Aviation and the French government would not be issuing any sovereign guarantee. 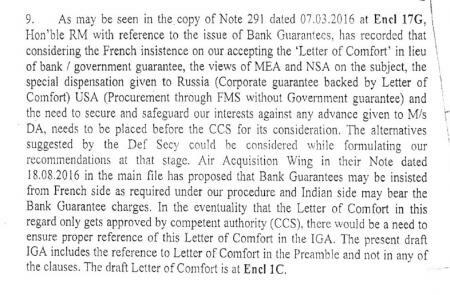 Here, too, it seems that the National Security Advisor (NSA) played a crucial role in making the Indian side accept the ‘Letter of Comfort’ from the French side in lieu of bank guarantee from Dassault or sovereign guarantee from the French government. The note says that the then Defence Minister Manohar Parrikar accepted the NSA’s and the Ministry of External Affairs’ view, both of whom had cited the example of a defence deal with Russia (corporate guarantee backed by letter of comfort) and from the US (procurement through Foreign Military Sales without a government guarantee). However, as Defence Minister of the country, Parrikar would certainly have been aware that there is a lot of difference between the G to G procurement from those countries, and the one he had in his hand at that time. It is known that American defence equipment sales happen through a US government-run programme called Foreign Military Sales (FMS), run by the Department of Defence. Under this, the purchaser does not have permission to deal with the seller directly. The deal is worked out through a US Government agency called the Defense Security Cooperation Agency, and the orders are accepted by the Defense Contract Management Agency (DCMA). In the case of Russia, Rosoboronexport, a Russian government intermediary, is the main agency through which all transactions are done. The corporate guarantee mentioned above is the guarantee of Rosoboronexport. In the case of the Rafale deal with India, France not only refused to give sovereign guarantee, the manufacturer, too, did not give any bank guarantee. Hence, comparing this with FMS and Russian corporate guarantee is an easy way to side-track attention from a failed responsibility. The note gives an impression that the suggestion was submitted to the Cabinet Committee on Security (CCS) headed by PM Modi without the Defence Acquisition Council taking any concrete call. To overcome the issue of French disagreement on the liability clause, which MoL&J said was onerous and was tilted against the interest of India, the Defence Secretary suggested rewording of the article and adding a new clause. However, the French side did not agree to the new clause and insisted on the earlier clause that the MoL&J had said was tilted towards France. Ravi Nair broke the story of the Rafale scam and is writing a book on the subject. The views expressed are personal.